We’ve run all of these bay boats through the inlet and out into the open ocean in search of sailfish, kingfish, mahi-mahi, and more. 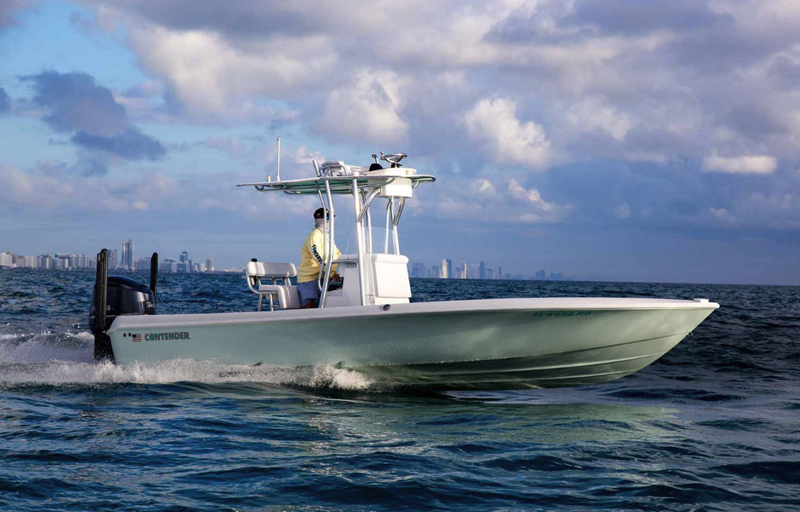 Center console fishing boats may rule the roost for overall fishability, and convertible fishing boats and expresses might be the first choice of dedicated oceanic anglers, but when it comes to light tackle fishing nothing can beat the bay boat design. 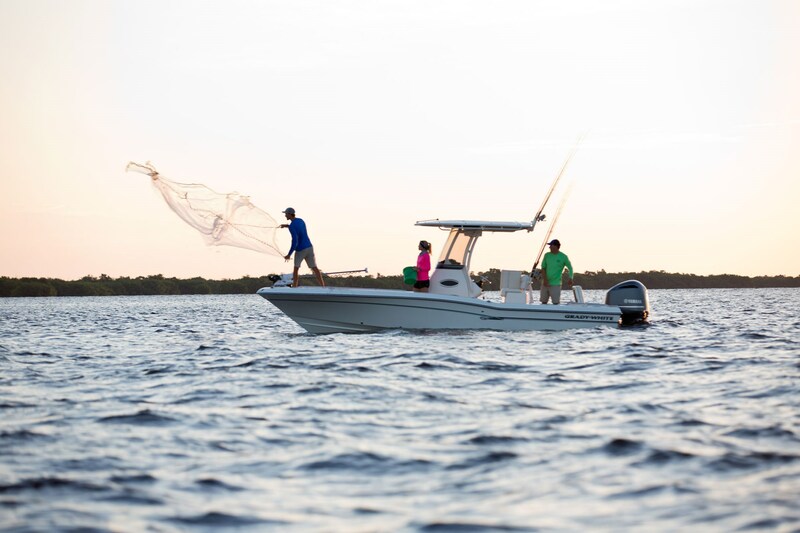 This is born out by their popularity; a genre born on the Gulf Coast and Florida’s southern waters to cast for reds, specks, and other inshore species, the average bay boat has distinct features including low-slung gunwales, raised casting decks, and gobs of livewell capacity. 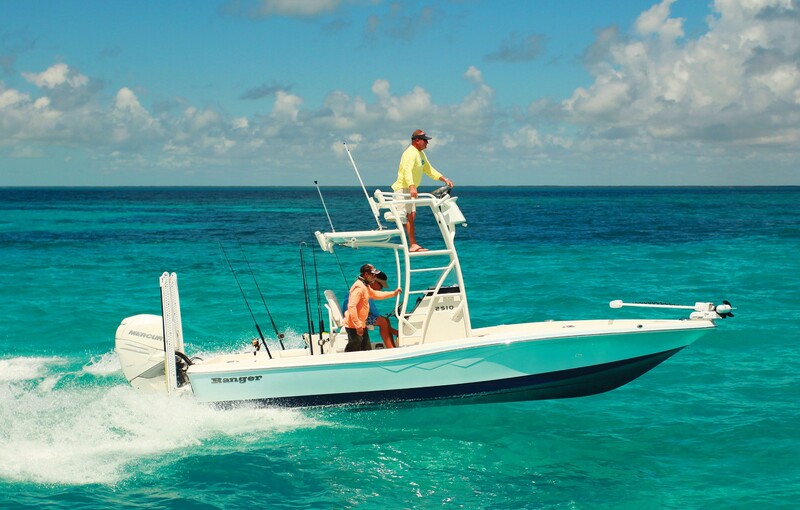 If an oceanic center console and an inshore flats boat could have kids, a bay boat would surely be the result. 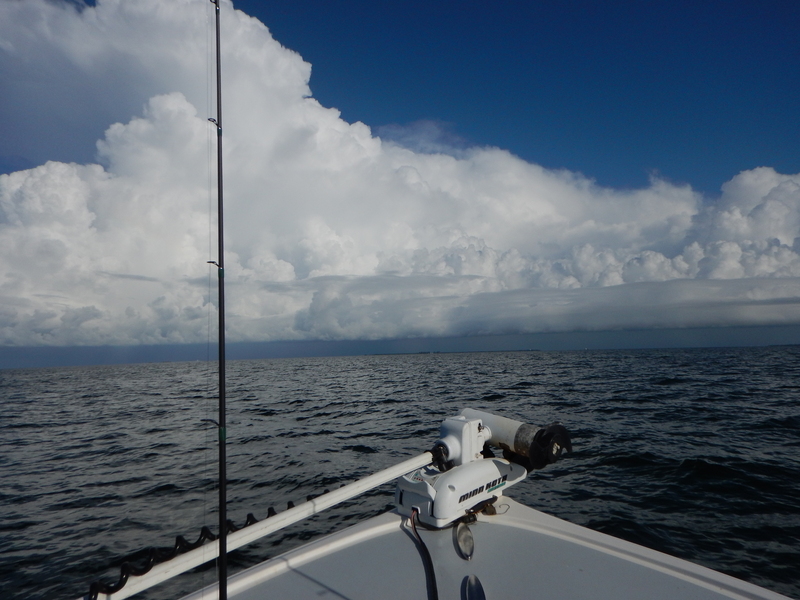 Many anglers, however, see one drawback to owning a bay boat: they really don’t have the beef to make runs out into the open ocean… right? We say no way – we’ve spent time on all five of these bay boats, and found them entirely capable of handling runs of 20 or more miles in the Atlantic, the Pacific, or the Gulf, on decent weather days. 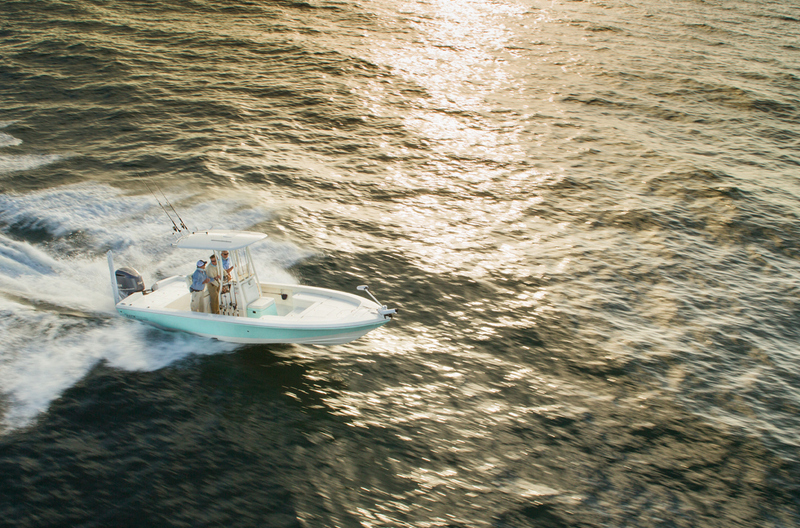 We ran this boat out of Crystal River, FL, but the specks and reds were off their feed – so we fired up the Yamaha F300 V6 4.2 liter four-stroke, pointed the bow west, and blasted 18 or 20 miles out into the Gulf at speeds of over 40 mph. The net result? Cobia. Lots and lots of cobia, followed by some snapper and then a goliath grouper, yet this boat never felt out of place even while land was out of sight. Best Perk: Feels rock-solid underfoot even at high speeds through the open ocean, and the twin-stepped hull design is uber-efficient. Biggest Drawback: 15.5-degrees of bottom deadrise and 4,200-pounds of displacement equates to a full foot of hull draft, a couple more inches than die-hard shallow water anglers prefer. Spending a day on the Crevalle 26 Bay proved eye-opening, especially as we learned how unique this boat is. It’s no copy-cat, with very unusual features like adjoining stowage compartments under the foredeck (so you can fit bulkier items), a drink cooler hidden under the folding aft bench seat, and misters built into the hard top. Sporting a Suzuki V-6 DF300AP, we cruised in the mid- to upper-30s in complete comfort. Best Perk: This boat is truly one-of-a-kind, and the build quality is absolutely top-notch. It’s also packed with standard features. Biggest Drawback: There are so many colored lights – including in the cupholders – that when you go out after dark you may wonder if you’re night fishing in a disco. Sure it looks cool, but we’re paying for all that stuff. 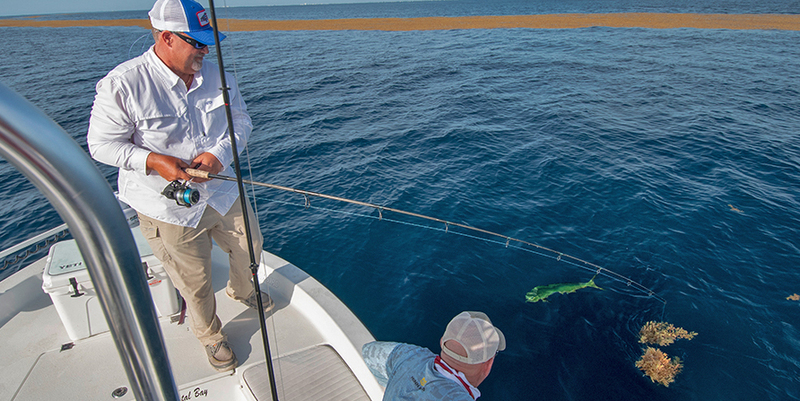 North Carolina’s waters offer one of the best fall catch-and-release fisheries for false albacore on the face of the planet – if, that is, your boat can handle the waters off Cape Lookout. We were quickly convinced that was no issue at all for the Grady-White 251 Coastal Explorer, thanks in no small part to its unusually high, flared bow. We also found that thanks to a 35-mph cruise (at 4000 rpm with an F300) and a hefty 78-gallon fuel capacity, making a long run back to the redfish grounds after catching some albies was no problem. Best Perk: The boat’s quite comfortable, with lots of poofy seating and a smooth dry ride. Biggest Drawback: The boat’s rather gentrified, with poofy seating all over the place. Also, while the tall bow enhances the ride in rough seas, it also increases windage and makes for a longer reach to the water when landing fish. A rather bumpy three-foot chop on top of an Atlantic swell wasn’t enough to stop the 2600 HPS, which we ran at around 30 mph (3500 rpm) while getting better than three miles to the gallon, thanks to the efficient twin-stepped hull. Four chunky cobia, a few bonito, and a kingfish later, we reversed course and completed our 20-mile round-trip. Back inside the inlet we cranked up the F300 and ran at 40 mph at 4500 rpm, then topped out at 52 mph running wide-open. Best Perk: Everything about this boat is big. You get an 80 gallon fishbox, a 48 gallon livewell (plus a 15 gallon well in the bow), and gobs of stowage including a dedicated compartment in the deck for your cast net. Biggest Drawback: Everything about this boat is big. The 8’10” beam may eliminate trailering options in some areas, and the 18-degree deadrise hull needs 15 inches to float. It was crammed with boat traffic as we approached Government Cut in the Ranger 2510, but we were there to give the boat a serious test. So we nailed the throttle and blasted across multiple series of near-vertical boat wakes at 50 mph as we made way for the ocean. That was all it took to ascertain just how rugged this bay boat really is. High-density urethane coring, vacuum molding, and pultruded parts all play a role, but here’s the bottom line: when this boat smashes into a wave you feel a muted thud, as opposed to a lesser boat’s hollow drumming. Best Perk: A 97 gallon fuel capacity and the solid ride means you’ll run this boat farther and harder than most. Biggest Drawback: Locating the livewell in the back of the leaning post instead of in the aft deck eats into cockpit space, and eliminates the usual spot for a carry-on cooler. True, you may not enjoy the deep plush seating found on some boats designed for long runs out into the deep. No, many bay boats don’t’ have the fuel capacity for epic runs to far-off canyons or the far side of the Gulf Stream. And we’ll readily admit that the minimal protection bay boat offers can mean getting wet and wind-whipped when the seas kick up. 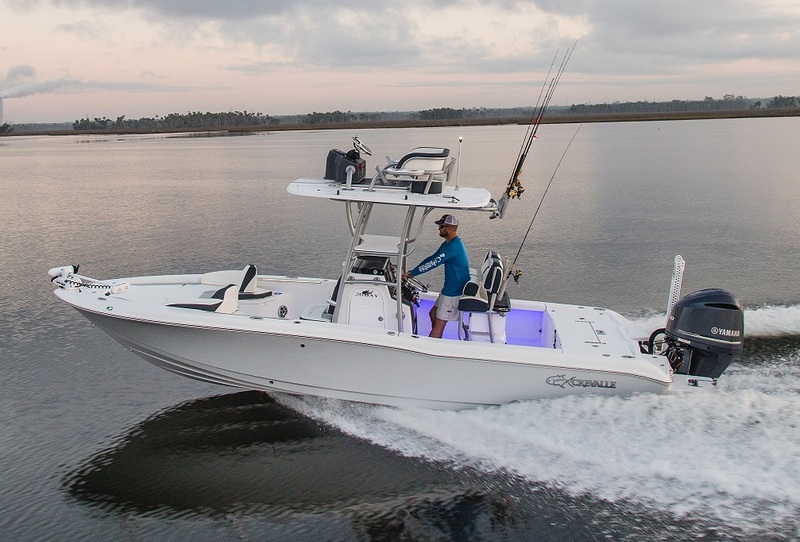 But if you want the ultimate in a light-tackle fishing machine without giving up the ability to pop through the inlet and hit the ocean when conditions are right, rest assured that these five bay boats can all handle blue water. Get more boat reviews and tips from Lenny Rudow on BD.